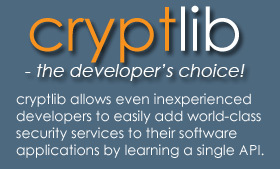 cryptlib supports secure network sessions using the SSH, SSL and TLS security protocols. As with envelopes, cryptlib takes care of the session details for you so that all you need to do is provide basic communications information such as the name of the server or host to connect to and any other information required for the session such as a password or certificate. cryptlib takes care of establishing the session and managing the details of the communications channel and its security parameters, and provides both client and server implementations of all of these session types.